When you’re stuck in town late at night and you’re looking for a decent feed, the options are few and far between. Thankfully, if you go a bit further up from Sean’s Kitchen on Station Road, you’ll come across the Barossa Cafe. It’s one of the few eateries in Adelaide that serve a range of hot and cold meals, as well as beverages, 24 hours a day. Located inside the Adelaide Casino, it has a unique setup with a walkway in the middle of the dining space that leads to the alfresco area. There are two counter areas with one serving main meals while the other serves sweets and beverages. Adelaide Food Central was recently invited to sample their new menu and we were impressed with their offerings. 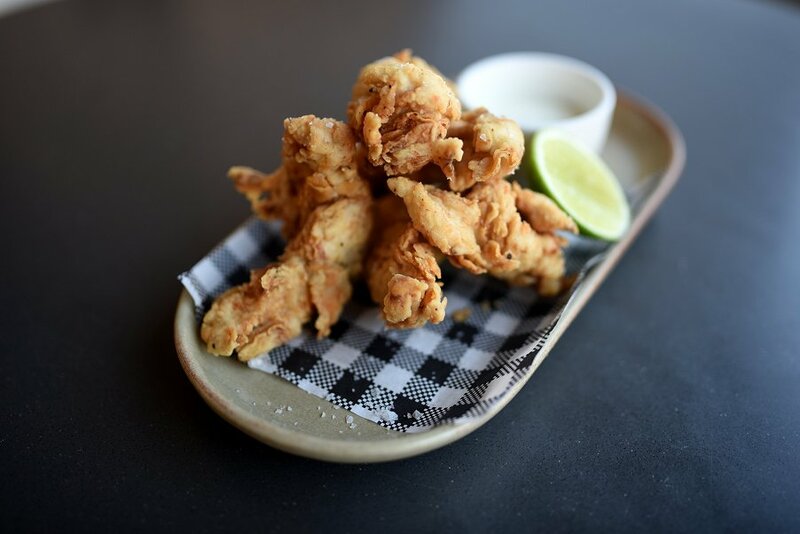 Barossa Cafe have come up with their own version of chicken crispy strips. Served in a lightly battered coating with their own blend of herbs and spices, Colonel Sanders would be turning in his grave if he tasted this. The thin strips of chicken breast were juicy and succulent, and the crunchy coating was seasoned to perfection. Not too oily on the hands either which is a very good thing! Next was the Pan Fried Salmon Fillet. The salmon had a lovely pinkish hue and the skin was nice and crispy. The fillet sat on a bed of potato salad that was tangy with just the right amount of dressing applied. We’d pay good money for this dish! The last dish we had was their version of Surf and Turf. 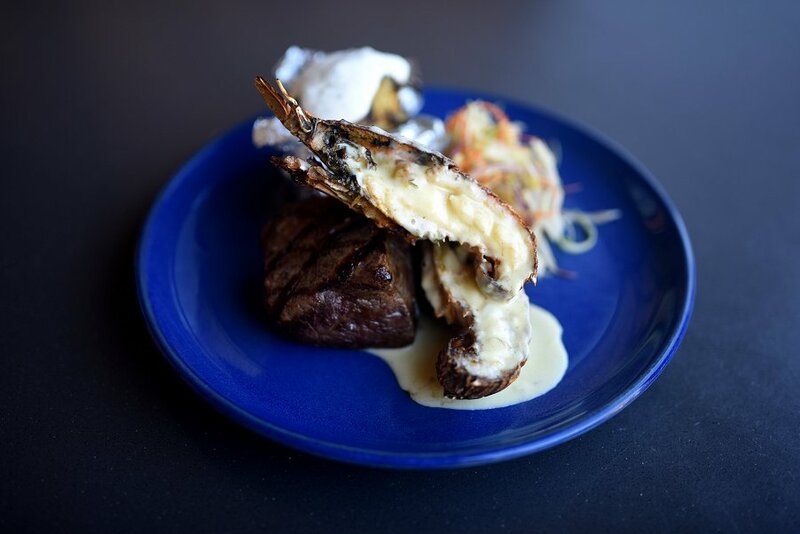 The Morton Bay bug was a generous size and the delicate meaty chunks that came out of it were to die for. The cut of beef that came with it was cooked medium rare with a beautifully charred exterior. Served with a side of coleslaw and a baked potato, this dish is just simple and delicious. The Adelaide Casino is well known for their established restaurants such as Madame Hanoi and Sean’s Kitchen. With smaller eateries such as Barossa Cafe introducing their new menu, it’s pleasing to see the other components inside the Adelaide Casino lift their game. 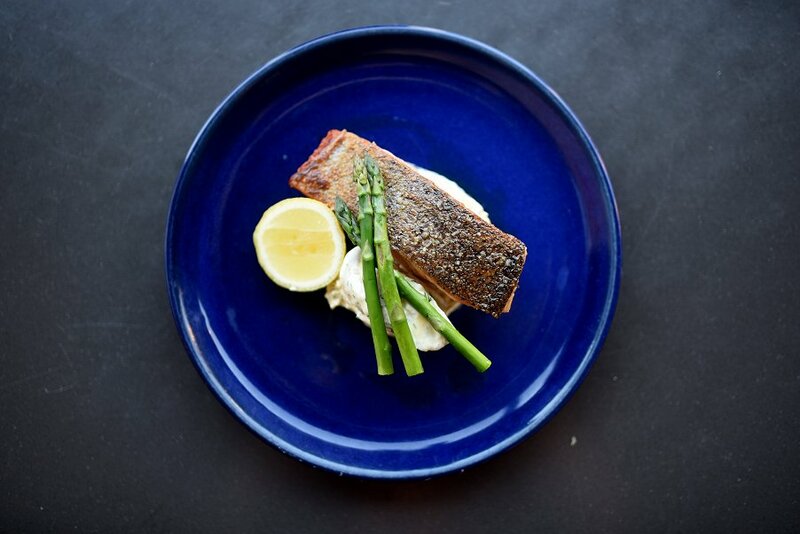 What’s even more remarkable is that quality dishes are available from the Barossa Cafe 24 hours a day. We were certainly impressed with what we had and we’ll certainly be back to try some more of the menu, at any time of day!